Hello everyone! It has been a LONG time since I've posted on Livejournal! As you guys know, I've already relocated to http://thoughtsramble.com but I would just like to share with any existing readers still here about my new project. Basically, I have been designing these phone cases for the past few months and I have finally released them just yesterday!!!! I have copied my post from Wordpress, you can read it below! I AM SO EXCITED TO FINALLY, FINALLY RELEASE THIS. 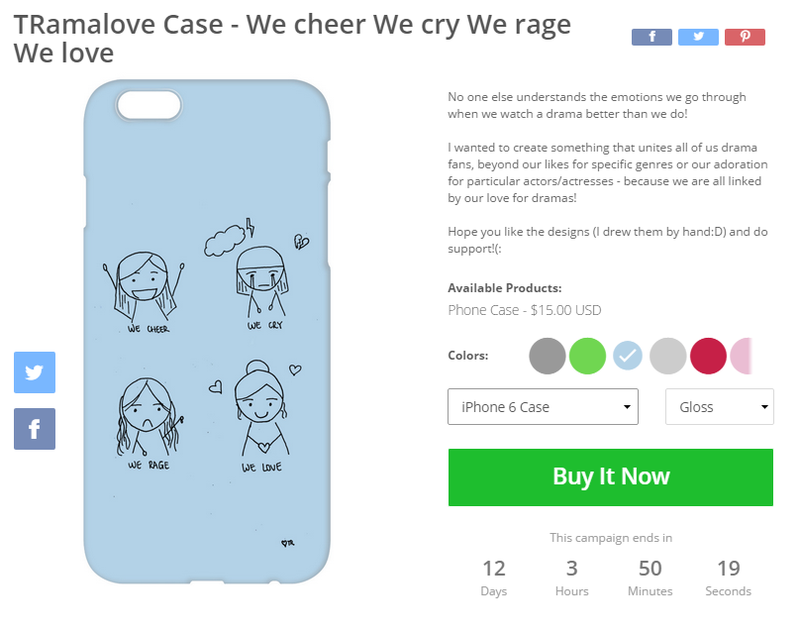 I have been working on this for the past months and now it's finally here - phone cases that I've designed personally are now available on TeeChip! I put in a lot, a lot of effort into this so I hope you can give me your support and at least click read more to find out more? :D I LOVE YOU GUYS! Before I show the pictures, let me just go into a little backstory for this. I have been wanting to design something for myself, my readers and just drama fans in general for ages. When I say ages, I mean like 2 to 3 years ago. But back then, I was still using Livejournal and that didn't seem like a good platform to do any project like this. (Or maybe I just lack technical skills and knowledge then hehe). I relocated to Wordpress and was contemplating using E-Commerce, but some of you guys might know - that's a really expensive thing to have. I was sad...does that mean I can never launch my project? Finally, one day someone I watch regularly on Youtube vlogs and another drama blogger* on Twitter both started using TeeChip. A light bulb well, lighted up. And so my journey to draw, erase, draw again and etc started. Before I ramble on too much, just like how my site name suggests, let me show you guys the pictures. I have in total 5 designs. The theme across all 5 designs is to create something that really applies to all of us - whether we like Taiwan, Japanese, American, Korean etc dramas, as long as we are drama fans, this is how we feel. In real life, I always find that if you chance upon someone who loves dramas as much as you do, the both of you are probably going to hit it off very quickly. Hope you guys like them! The inspiration for this came almost immediately. I have been watching dramas with my mother since I was probably 5. And since then, I've never once stopped loving dramas. You can find this here: https://teechip.com/tramalove . The words are in black and the colours available are mostly pastel/bright colours. Well, happiness! This is one thing that I find it hard to explain to anyone who doesn't have the same love for dramas. So we pretend that everything is okay in front of them, when really, we are just dying inside. HAHA. You can find this here: http://teechip.com/tramabluesss in white words on ALL colours! I must admit, this inspiration came from knowing that a fellow drama blogger is a guy. That is pretty surprising because this community is mostly made up of females. *I shall not reveal his name because I'm not sure if he wants me to declare his gender to everybardy here* but yes this is inspired by you HAHA. After drawing this, I realise that hey - this pretty much describes my guy friends when they watch a match too! You can find this in black words on bright colours here: https://teechip.com/tramaforguys and in white words on dark colours here: https://teechip.com/tramaforguystwo . Buy this for that vocal guy friend of yours! This is probably one of my most favourite designs, and I hope you like it too! In the past, I fell in love with 99% of the second leads because well...I suffer from that syndrome yes hahaha. Now, I would say that the percentage has gone down because second leads nowadays are either evil or I'm already in love with the main lead. Or I simply get fed up with scriptwriters trying to make the most stupid female lead being ignorant to the second lead's feelings. Does that sound like you? Because I sure hope I'm not the only one! 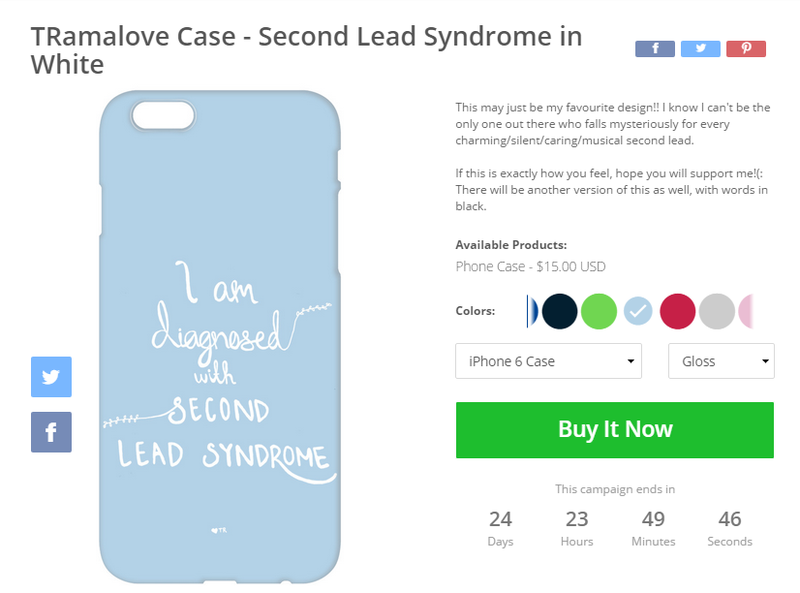 You can find this in black words on pastel/bright colours here: https://teechip.com/tramasecondleadsyndrome anddd in white words on ALL colours. I love how it turns out so much that I must show you now! Wheeee. You can find this here: https://teechip.com/tramasecondinwhite . I am so sorry, but because of the way it's designed, this image is more suitable for bigger phone cases such as Iphone 6 and Galaxy S3-5. I really had a lot of fun doing this and I learnt new editing skills. 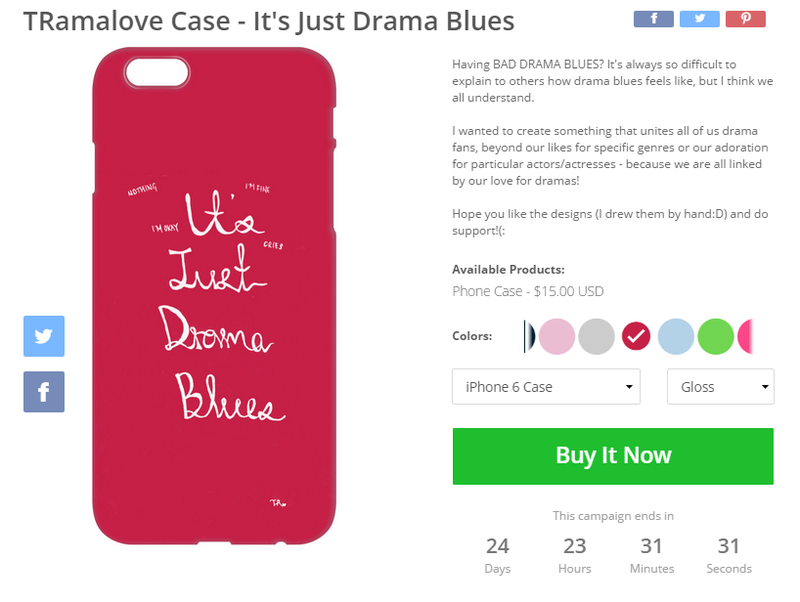 It's called TRamalove cases because well...I'm called Thoughts Ramble...and TRama sounds like Drama....I hope that isn't too lame for you guys HAHA. BUT I LOVE IT. You can find more details here: http://teechip.com/faq. As far as I know, this is a pretty reliable site and many people I know have been using it. 2. How much are your products? 3. What does 'this campaign ends in' mean? This is more applicable for products like t-shirts, if I'm not wrong. For those products, the items will only be shipped once the campaign ends. 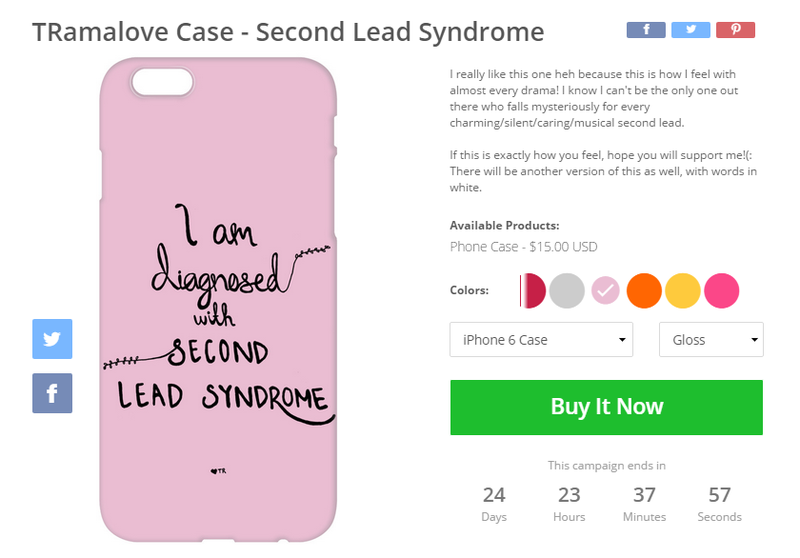 However, for phone cases, you will get your product in a period of time measured from when you place your order, not when the campaign ends. I've placed all my products on automatic renewal - which means that essentially, the campaigns will keep running! *Kfangurl was the dramablogger I saw on Twitter who used TeeChip. I've already checked with her a few months ago and she's cool with me rolling out this project on TeeChip as well! I really hope you guys can show your support by clicking on the links and checking them out. If you buy more products, shipping gets cheaper(: I can't believe that this is finally done hahaha. If you have any comments/feedback for improvement/words of encouragement/simply want to send some love, DO COMMENT BELOW. I love reading comments. I love you guys too! I really spent a lot of effort into this project so it would mean a lot to me if you could at least check out the items and see if there's any which catches your eye! 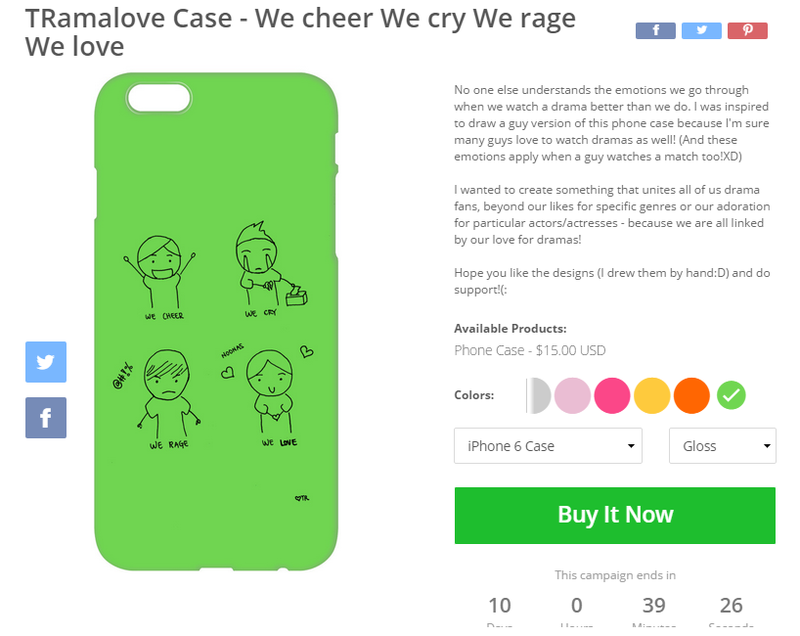 If you like the items/wanna send me some love, do comment either here or on my word press article directly: http://thoughtsramble.com/2015/09/26/tramalove-phone-cases-on-teechip/ . I reallllyyy love reading comments so even if you can't buy, just sending me some virtual encouragement will be just as great!